My journey to leading the international development team at Blaze Pizza began when I joined the company in October 2012. At the time Blaze had just one location, in Irvine, California. We opened a second restaurant in Pasadena soon after. Since then, I have spent the past 6 years championing Blaze Pizza's expansion to more than 290 locations in 40 states and 5 countries. Our company was always imagined to be a franchise organization and, from the very beginning, we forward-invested to build the infrastructure needed to grow rapidly. With a goal of expanding to 1,000+ restaurants, we knew that each process, procedure, and system we put in place had to be able to scale. Every department - real estate, design/construction, operations & training, marketing, and finance - put "best in class" systems in place to ensure we could support our franchise community. We had a national food supplier in place before we opened our first location. We also forward-invested in our support center, bringing together a team of restaurant industry professionals who had extensive experience working with franchisees. Foundation is everything! As we began franchising, our domestic growth strategy was to award large territories only to experienced multi-unit restaurant operators who currently ran other QSR or fast casual brands and were looking to add another growth vehicle to their portfolio. We also made sure that they fit culturally within our organization and shared a mindset aligned with our core values. With a national food distributor already in place, we were able to enter any market where we found a great operator. We knew that our partners' local knowledge would be key to successfully developing their territories, and we encouraged them to foster strong a connection between their restaurants and their communities. As we onboarded this group of new franchise partners, we created an "Everyone has a voice, everyone has a seat at the table" culture, and leveraged the power of collaboration and experience to support our rapid expansion goals. With a foundation built solidly from the beginning, it made it easier to begin international expansion. Once again, we chose to partner only with experienced operators who own and operate QSR or fast casual restaurants. In our international markets, we know we must rely more heavily on our franchisees to help us navigate the supply chain, adapt to the local consumer, and optimize their overall financial model. The stakes are even higher, and the selection process even more rigorous. The agreement with our first international partner, in Canada, was signed in September 2014. This partner also is the largest Five Guys franchisee in Canada, and the group's culture of "best in class" operations and dedication to developing their team was well-aligned with our own organization's values. When we signed the agreement, we had opened only 32 domestic locations, but we had the systems and support team in place to grow beyond the U.S. and felt confident we had selected the right partner. Our decision has paid off: our Canadian franchisee currently has 11 restaurants open, with another 12 scheduled to debut before EOY 2019. In addition, our AUVs in Canada are among the strongest in our system. Shortly after we announced our Canadian development agreement, we began receiving numerous inquiries for other countries, and crafted a more comprehensive international growth strategy, which includes two main guardrails. First, we continued to seek to partner only with experienced operators who currently own/operate restaurants in their country through an area developer model vs. a master franchise model. Second, any prospective partner must demonstrate an ability to develop a minimum of 20 locations. In April 2018, when we had 190 locations open, we signed our second international deal, partnering with the largest F&B operator in the Middle East. This group currently owns and operates more than 200 U.S. brands, including P.F. Chang's, Cheesecake Factory, Shake Shack, Raising Cane's, and more than 1,000 Starbucks. Their culture of best-in-class service to their guests and their employees is aligned with our own, and the partnership is very strong. This group now has four locations open (2 in Kuwait, 1 in Saudi Arabia, and 1 in Bahrain) and five more are expected to open by Q1 2019. Perhaps our biggest "lesson learned" in international development has been that we did not anticipate the number of in-country visits we would need to make before a country launch. Moving forward, we have built the cost of that support into our agreement fees and are budgeting accordingly. Our plan for the next 5 years is to sign two new international partners each year. 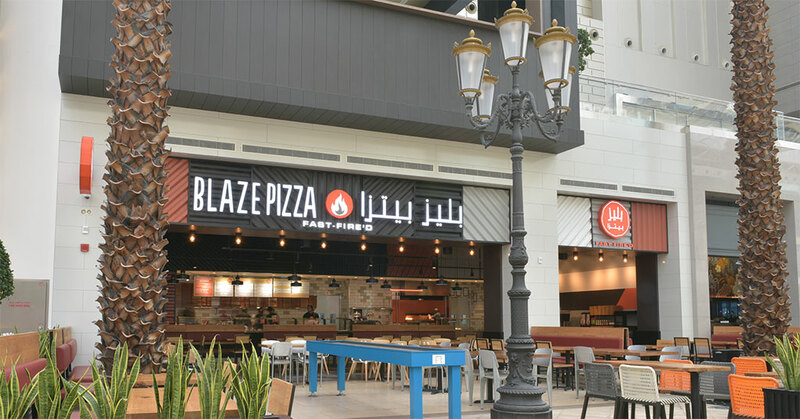 We will forward-invest in hiring additional international support members to stay ahead of the growth, and feel confident that this approach will lead to a very strong international division for Blaze Pizza. Carolyne Canady is a franchising expert with 30+ years of experience. In that time, she has worked with a number of prominent restaurant brands, including Taco Bell, Carl's Jr., and Buffalo Wild Wings. She is currently President, International and Chief Development Officer at Blaze Pizza. She joined the company in October 2012 when there was only one restaurant open, and has helped lead the brand's development to more than 290 locations in 40 states and 5 countries.